Gujarati kadhi , is one of my favorites when it comes to comfort food's especially when it is enjoyed with rice. Kadhi is made from buttermilk that is cooked over low heat with spice powder, and a little sweetness to give that complete taste , this dish is from the Western part of India , from the state of Gujarat. .It is usually served hot with pooris, rotis, or have it with rice. 1.Mix the yogurt with water in a medium size mixing bowl, using a whisk. Add gram flour,continue to whisk till no lumps of gram flour is visible,add crushed ginger,green chilies,salt, sugar. 2.For tempering, Heat a wok,add oil and clarified butter,add cumin seeds,allow them to splutter, add cloves, cinnamon stick,fenugreek seeds,asafetida and curry leaves , carefully add the curd and gram flour mixture, stir together. 3.Continue cooking on low to medium heat for the next 15 to 20 minutes,add in lemon juice.Check for salt and cook for just another 10 minutes or until the mixture boils well. Enjoy hot kadhi with rice. 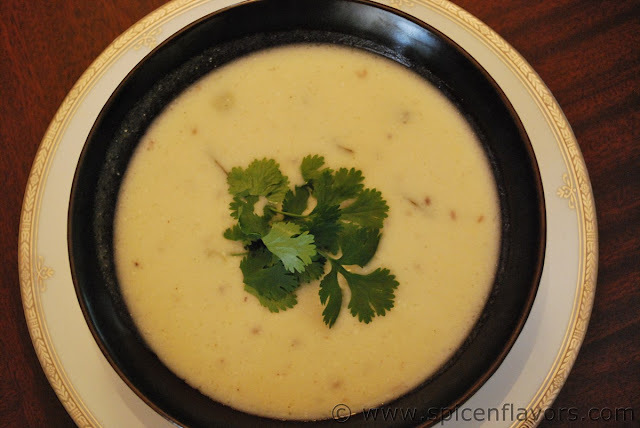 Very droolworthy Gujju Kadhi Dear, Awesome recipe. Very flavorful n delish..I love this with steamed rice! I love Gujrati Kadi....mouthwatering & very tempting! !